On a recent episode of Community, the film-obsessed character known as Abed (Daniel Pudi) is having a birthday party through for him. His friend, Jeff (Joel McHale) is aiming for a Pulp Fiction-themed surprise party, but first must meet with Abed at a restaurant, at Abed’s request. The two meet, with Jeff immediately aware of Abed’s different appearance and behavior – he has exchanged his typical college clothes with a sweater and dress-pants ensemble. The confidence that Abed exhibits in ordering from the menu is in stark change to his normal order of fast-food. Even his facial tics are dramatically different (if you pay attention to that sort of thing). Finally, Abed goes on a tangent, telling a story about a traumatic experience that has made him this way. The camera is initially at a distance, but by the time his monologue ends, you’re brought to a close-up. The scene is one of the finest moments in Community’s two seasons, and a fine example of Daniel Pudi’s acting ability. Upon the realization that the episode was parodying Louis Malle’s My Dinner with Andre, I knew I had to place it at the top of my queue. Louis Malle’s film initially begins outside the confines of its restaurant setting. 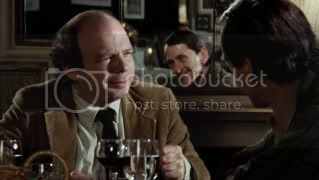 Wally (Wallace Shawn) narrates his life – he goes through his daily routine as he ponders where his life forked wrong, money, and his girlfriend. They’re all very matter-of-fact thoughts that give you a sense of what kind of person Wally is, therein preparing you to know at least one person at the dinner table once the time comes. Wally meets with Andre (Andre Gregory) with a sense of reluctance. He hasn’t seen Andre in a while, and the idea of being one-on-one with him doesn’t sit right with Wally, particularly because he has heard some odd rumors circulating about Andre’s personal life. But as the two sit down, you gather that any reluctance on Wally’s part is melted away. The conversation is a bit one-sided – Andre’s life is worldlier than Wally’s, and therein he shares stories that see him traveling with a theatrical group and being buried alive. So Wally, like the audience, is the everyman. And like the audience, Wally listens, though interjects from time to time with his thoughts. But as the conversation wears on, you see Wally begin to defend his stance on life and the routine. These moments when Wally takes the reins of the conversation are enhanced by screenplay’s (written by Gregory and Shawn) decision to start the film outside the confines of the restaurant. The more I reflect on My Dinner with Andre, the more I grow to appreciate it. The subtle touches to the filmmaking are exquisite – you gather that Malle planed out every shot to maximize the importance of words while containing the action within a booth. And the conversation! It flows perfectly. When Wally and Andre meet, their conversation begins awkwardly, but as the two hours pass by, you feel an organic growth between the two. 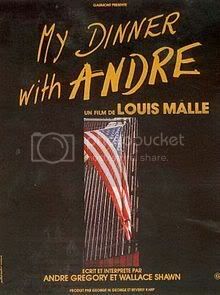 It’s something that I’ve been missing dearly in film lately, with My Dinner with Andre capturing a yearning for connection so astutely. By the film’s end, you sense a greater force pulling you in – a desire to connect. Similar to my reaction to Dressed to Kill, I found Blow Out to be the sort of film the relishes in its B-movie sensibilities and grit, while being a richly competent directorial effort. The way this film is put together is incredibly smart. Tension wrests in the most mundane situations, such as when Jack Terry (John Travolta) attempts to piece together the sound of an accident with images he clipped out of a magazine. Terry merely sits, flipping switches and rewinding tape, until both he and the audience connect the pieces together. It’s an exceptionally rewarding experience; one that is oddly meshed with a seedy underworld that I gather is a De Palma trademark. It doesn’t quite trump the glee I had while watching Dressed to Kill, but Blow Out edges that film out in its sharp character development. Travolta in particular, reminded me of Jake Gyllenhaal in Zodiac – the sort of obsessive, sleep-ridden character who seeks personal justice as a means of proving something to themselves. Though with Travolta’s character, his very occupation is used as a backdrop to establish that he has a score to settle – lives to save, people to avenge. In that way, it really does come across as one of his best roles. Nancy Allen is adequate as Sally – the perpetual damsel in distress. The screenplay gives her quite a bit to work with, but honestly, I found her acting to be a bit too over-the-top and derivative. Nevertheless, De Palma’s stock with me continues to rise. He brings a unique flair for aesthetics and characters, while presenting his world of grime and decay with unusual and effective framing methods. He’s obviously influenced by Coppola and Hitchcock, but the way in which he manipulates their sensibilities with his own is a delightfully lurid marriage.